Directed by: Ronnie Rondell Jr.
Clete Harris (Hauser) is a CIA agent who is undercover in Honduras, using a remote Peace Corps station for his base. 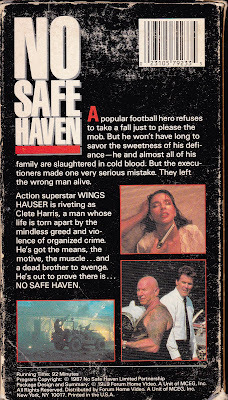 When he finds out his beloved brother Buddy (Campitelli), a star football player, was murdered in a drug deal gone wrong, Clete comes back to America to find the culprit. This evildoer even killed his own mother. It turns out it’s psychotic gangster Manuel (Richmond) and his gang of goons. Clete then makes it his mission to track them all down and get revenge. To help him in this mission, he recruits Popeye (Tessier), a survivalist type. They both end up in Bolivia and the final battle ensues. 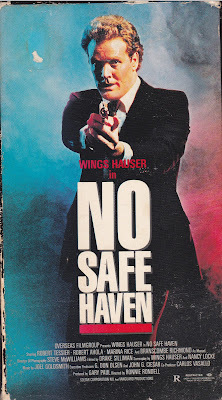 No Safe Haven starts humorously enough, with Branscombe Richmond screaming while shooting his guns, and a Roger Corman-style “fast motion” car chase follows. Once Wings appears on screen, we remember why we’re watching this. He brings his classic charisma in spades. Richmond makes a great baddie, and his over-the-top yelling and drug-running, loan-sharking evilness make you want to see more of his work. He makes a great villain to play opposite the lovable Wings. Robert Tessier almost steals the movie as the down-and-dirty Popeye. True to his name, he even proudly sports a corncob pipe! Thankfully he also has his no-shirt-and-jean-jacket combo as well to round out his wardrobe. It was nice to see him in a kindlier performance. He can easily play a heavy, as evidenced in Future Zone (1990). 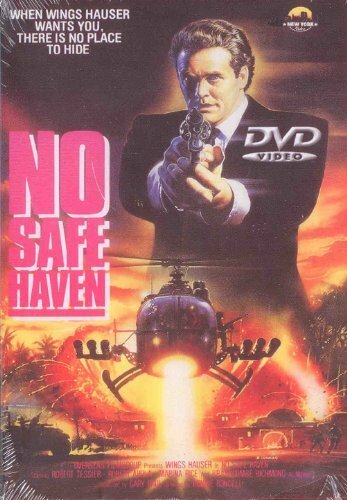 This movie is the only directorial effort to date from Ronnie Rondell, a man well-known in the stunt world. His inexperience shows in some of the pacing - it slows way down before the climax, which is a common pitfall, but the movie becomes an El Presidente flick seemingly out of the blue right at the last minute. While that might seem a bit mundane, the reason, presumably, why it happens in the first place is that Clete and Popeye’s revenge mission is so uncontrollable and grandiose, they want to get revenge on cocaine itself! And seeing as how we may have just built this solid, but small B-film up to heights it doesn’t really reach, we should mention how clunky some of the acting by the non-leads is. Just check out the Harris mother. 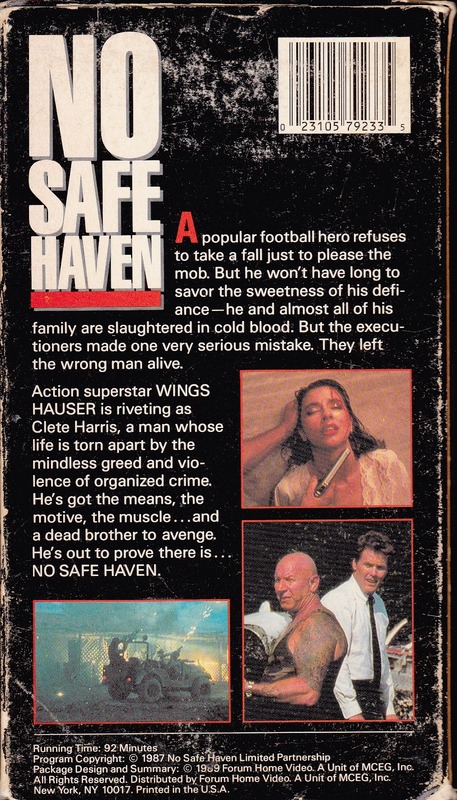 One of the more interesting things about No Safe Haven is the box art. It seems to be a specially posed picture in a studio by Wings. It wasn’t taken right from the movie, it is its own photography. And the theme song of the film, played during the end credits is “dream girls”, by none other than Isaac Hayes! That was a surprise. Too bad he wasn’t in the movie as an actor. 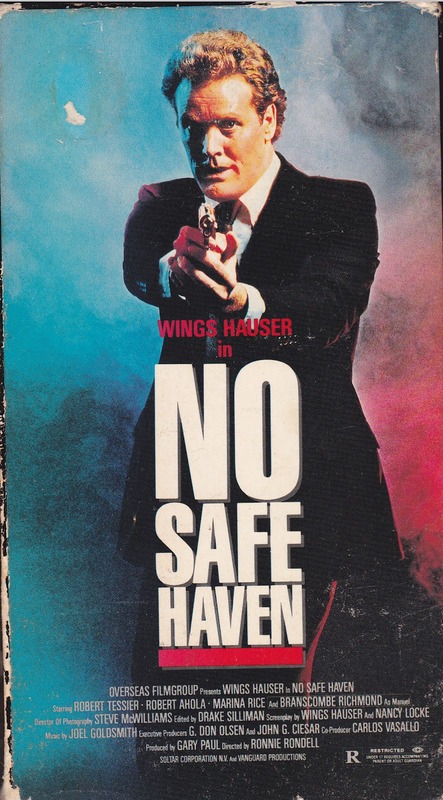 In all, No Safe (as all the cool people call it) is enjoyable because of the main presence of Wings Hauser, and to a lesser extent Robert Tessier and Branscombe Richmond. Without these guys, it would have been a different and more trying experience. Thank goodness for them. Also check out our Wings buddy DTVC's review! Well i'm a sucker for El Presidente films and this one sounds decent enough. What's your favorite El Presidente film? It is a matter of personal taste, but Cocaine Wars stands out as a classic 80s El Presidente. Yeah that's a good one, I also love McBain. That was pretty good too. Loved the opening bit when McBain and his pals are stopping the drug dealers in New York.